INVESTMENT OPPORTUNITY......CURRENTLY TENANT IN UNIT UNTIL JAN. 2020 ........The location is wonderful and the views magnificent. There's nothing like it in the neighborhood. This is a perfect home or investment property. And the living is the best. 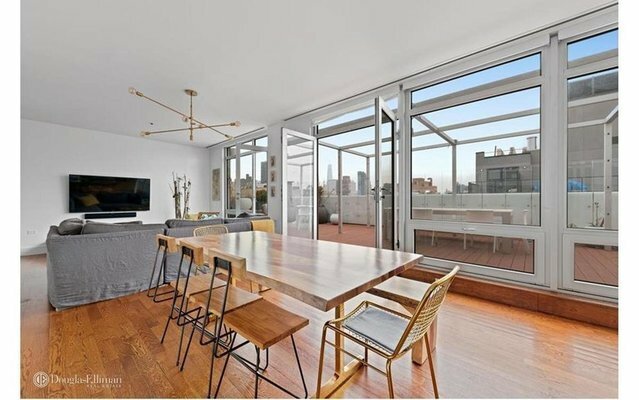 A 7th floor penthouse loft, 1775 square feet, in the heart of the vibrant Lower East Side. 4 bedrooms, 2.5 baths, chef's kitchen, central air conditioning, 2 private terrace, separate laundry room, top-line amenities. THE LIVING ROOM. Spacious, sunlit with oversized windows and high ceilings. The flooring is wide-plank white oak. The living room opens onto a charming west-facing planted terrace with an automatic irrigation system. The Manhattan skyline from the terrace is absolutely breathtaking. It's post-card perfect. THE MASTER BEDROOM & BATH A grand suite with a west-facing terrace, a walk-in closet with custom built-ins. The master bath has an oversized rainforest shower, Tigerwood vanities and Italian double-size trough sinks with Grohe fixtures. THREE ADDITIONAL BEDROOMS Well-proportioned, ample storage, sharing a separate bath that includes a Zuma soaking tub. One bedroom opens to the east-facing balcony. THE KITCHEN If you're not patronizing the wonderful array of restaurants on nearby Clinton Street, this terrific home has a beautiful chef's kitchen. Moss granite countertops, breakfast bar, Wenge finish custom cabinets, a Viking stove/oven, Sub-Zero fridge, wine cooler and a Miele dishwasher. THE LAUNDRY ROOM The laundry room is equipped with an LG washer and dryer and four storage closets with custom built-ins. OTHER STORAGE A private storage space is located in the basement and comes with the unit. THE BUILDING Constructed in 2005, it is a well-maintained boutique condominium with a common, furnished roof deck, a health club, superintendent and part-time doorman. THE NEIGHBORHOOD Inviting, eclectic, with easy access to the F/M, J/Z trains. Houston Street is just steps away. Shopping is everywhere. There is a Whole Foods, Essex and Union Markets. The entertainment and boutiques enrich the appeal of the neighborhood and the East Village.